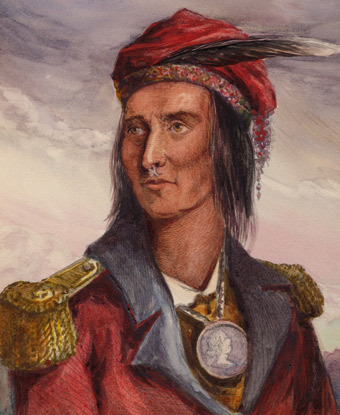 Providing spiritual impetus for Tecumseh’s movement was the teaching of his younger brother, known as Tenskwatawa, The Open Door, or The Prophet. In 1808, the Shawnee brothers established a new capital on the banks of the Wabash and Tippecanoe rivers, while Tecumseh traveled extensively in an effort to build his alliance. Despite a number of victories, this partnership turned fatal on October 5, 1813, at the Battle of the Thames River. Outnumbered three-to-one by General William Henry Harrison‘s army, the Indian and British forces were overwhelmed, without fortifications, and ultimately doomed. Tecumseh’s vision of a unified American Indian homeland was never fully realized. Within 35 years of Tecumseh’s death at Moraviantown, many Native nations east of the Mississippi River were forcibly relocated. But today the great Tecumseh is still revered for his intelligence, leadership, and military skills, and he is honored throughout North America.